Little, Brown Books for Young Readers, 9780316286909, 240pp. A mysterious sickness from the Imaginary World is sweeping the town of Buttonville. Dr. Woo, Metalmouth, and even the sasquatch have fallen ill. According to Mr. Tabby, the only known cure is a griffin's feather, but there is none in the hospital. Keeping an eye out for Maximus Steele, a poacher wanted for crimes against Imaginary creatures, Ben, Pearl, and Mr. Tabby make their way through the Portal. But danger looms on the other side. Can they persuade the griffin, king of the Imaginary World, to surrender a feather? And at what cost? Suzanne Selfors delivers a wild journey filled with mythical creatures and zany adventures that are anything but imaginary. 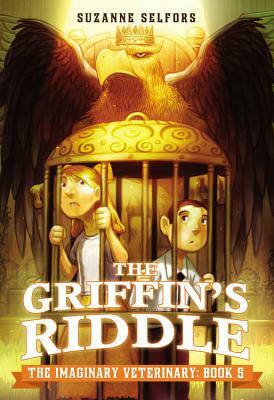 This book includes bonus writing, art, and science activities that will help readers discover more about the mythological creatures featured in The Griffin's Riddle. These activities are designed for the home and the classroom. Enjoy doing them on your own or with friends! Suzanne Selfors is the author of the Imaginary Veterinary series, the Ever After High: A School Story series, the Smells Like Dog series, Fortune's Magic Farm," To Catch a Mermaid," and many other books. She lives close to the sasquatch-infested rain forest of the Pacific Northwest.Dan Santat is a children's book writer and illustrator. He graduated from Art Center College of Design and lives in Southern California with his family, a rabbit, a bird, and one cat. "The best books are those in which imaginary creatures leap off the page and into our world -- just one of the reasons why this book is a ton of fun. I can't wait for more adventures!"